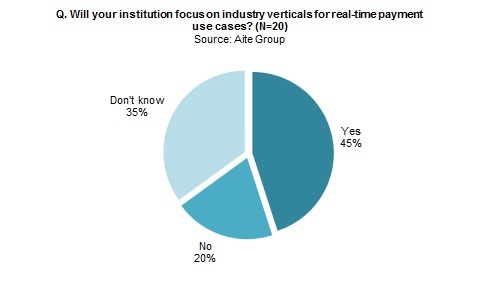 Real-time B2B payments have arrived in the U.S., but banks lack consensus on use cases. Boston, May 30, 2018 – Banks hesitate to make large technology investments in a new payment workstream without a clear market demand and a realistic expectation for adoption. But with the launch of The Clearing House’s RTP system, banks that don’t develop a strategy around business-to-business real-time payments risk falling behind. This research overviews U.S. financial institutions’ real-time payments adoption for B2B payments and is primarily focused on The Clearing House’s RTP system. Based primarily on the results of a January through March 2018 survey of 20 of the top 60 U.S. banks, it predicts implementation timelines, transaction volume, and methods of initiation, and offers thoughts on market ubiquity. This 31-page Impact Note contains 23 figures and three tables. Clients of Aite Group’s Wholesale Banking & Payments service can download this report, the corresponding charts, and the Executive Impact Deck. This report mentions ACI Worldwide, BNY Mellon, Citi, Cognizant, Deloitte, ECS Fin, Evertec, Finastra, FIS, Fiserv, IBM, Icon Solutions, Intellect Design Arena, Jack Henry, JPMorgan Chase, PNC Financial, Push Payments, SunTrust Bank, SWIFT, U.S. Bank, and Volante Technologies.